The occasion is the prestigious Pebble Beach Concours d’Elegance and the cars are the most prized on the planet. 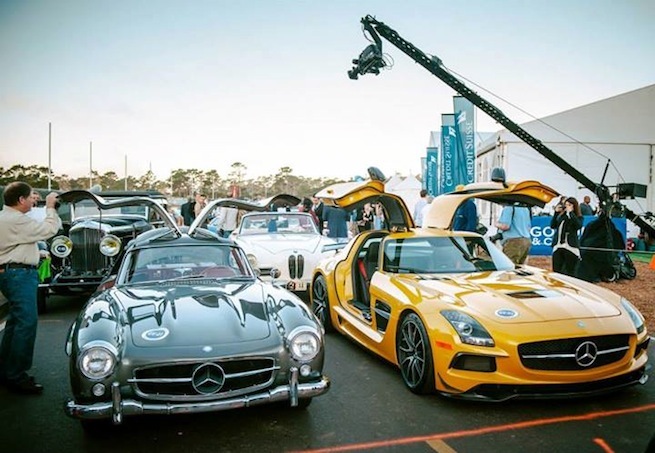 Mercedes-Benz brought two highly sought after cars, the 1955 Mercedes-Benz 300SL and 2014 SLS AMG Black Series Coupe to the prestigious event. There are some historical similarities between the two, they are essentially road-going versions of winning race cars. They also share a distinctive gull-wing design. The Mercedes-Benz 300SL was the first iteration of the SL-Class grand tourer convertibles and fastest production car of its day. It was first introduced in 1954 as a two-seat sports car with distinctive gull-wing doors and later offered as an open roadster. Built by Daimler-Benz AG, the fuel-injected production model was based on the company's highly successful 1952 race car, the Mercedes-Benz 300SL. Today, the 300SL with its unique doors, technological firsts, and low production numbers is considered one of the most collectible Mercedes-Benz models, with prices in the $700,000-$1,000,000 range USD. The 2014 Mercedes-Benz SLS AMG Black Series is the fastest and most extreme SLS variant of all time. The fifth Black Series model from Mercedes-AMG was inspired by the racing version of the SLS AMG GT3, and is the fastest version to date. The performance supercar is lightweight, powerful and the breathtaking design is sure to excite anyone who views the car at the Pebble Beach Concours d’Elegance this weekend. Once each year, on the third Sunday in August, about 200 of the most prized collector cars and motorcycles in the world roll onto what is often called “the best finishing hole in golf”, the famed eighteenth fairway at Pebble Beach. The prestigious Pebble Beach Concours d’Elegance is not a contest of speed, but of excellence. Automobiles and motorcycles are judged for their historical accuracy, their technical merit and their style. and only the best garner awards and recognition. The Pebble Beach Concours d’Elegance is often said to be the world’s premier celebration of the automobile. It’s the perfect venue for Mercedes to show off the collectible 1955 Mercedes-Benz 300SL and intoxicating 2014 SLS AMG Black Series Coupe side by side. Torque News is your headquarters for the latest Mercedes-Benz news.